As far back as I can remember, there have been two foods I absolutely love, ICE-CREAM and CAKE. I think it’s no mistake that the two go so well together (but not in the same bowl, I don’t like the ice-cream making my cake soggy, or my cake making my ice-cream gritty). I can eat good cake and good ice-cream until I’m sick! Given my love for both, it was no surprise to myself when I first realized I would love to have a bakery and decorate cakes and bake all day. It started about 11 years ago when my college roommate and I started baking cookies (LOADS OF COOKIES) and putting them in decorated bags for our friends at the UC (secretly of course). This spread to more baked goods and dinner parties. 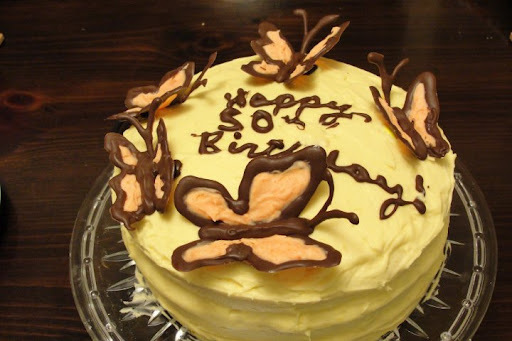 I started baking and “decorating” cakes for the birthdays of some of my close friends. I knew at that moment I wanted to keep doing this and learn more so my creations would look (and taste) better. When I was planning my wedding, I even thought about making my own wedding cake. Thankfully my mom talked me out of that one. After all, I was already arranging all my flowers and making my really long veil during a very busy semester my last year of college. I’m sure it had nothing to do with the fact all of my baked goods up to that point tasted great, but lacked a little in the looks department. I wish I had some pictures to show you of some of my first stacked cakes, but if you were one of the “lucky” ones, you probably remember all too well and were just nice enough to not let me know it wasn’t exactly pretty. After I was married and finished with college, I realized the dream I had of taking some decorating classes wasn’t really going to fit with my budget, schedule, and location. 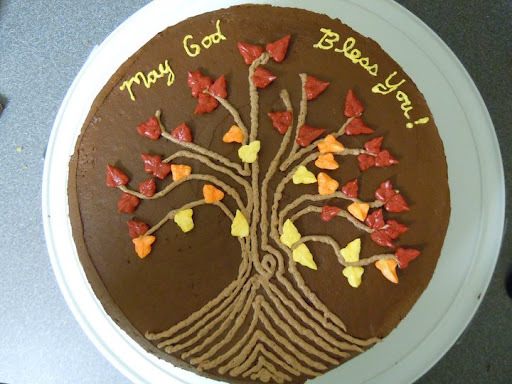 I put this hobby aside and went on making an occasional cake or something for church and work pot-lucks. Then we moved to La Grange, TX. I stayed home with our 1 year old and decided I would like to start baking again and since I wasn’t going to be able to take some decorating classes, I decided to get the materials and teach myself with the aid of the internet. Some of my cakes did not work as planned, but I still learned, and had a blast. 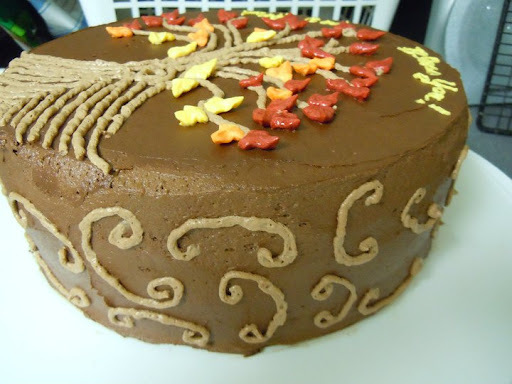 With every cake I have baked and decorated I’ve improved and learned something important about the art. 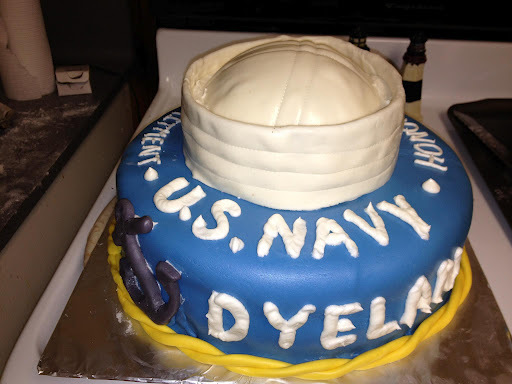 This is one of the first cakes I decorated when I was still dabbling. I had not decided to really learn how to do things the right way. 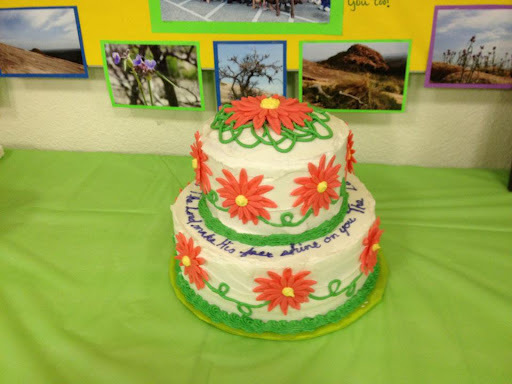 I still had the idea stuck in my head that I had to take a class in a classroom to teach me how to decorate a cake. I didn’t realize I could learn, on my own, with some great resources. 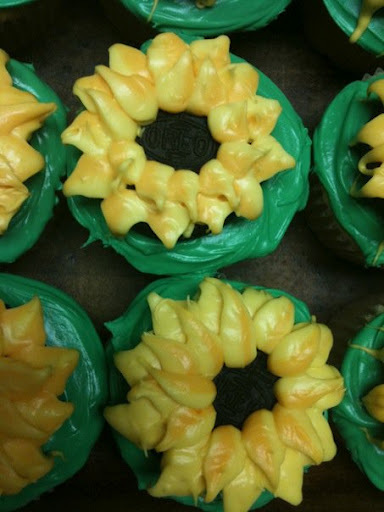 These are some cupcakes I decorated about the same time I made the butterfly cake. 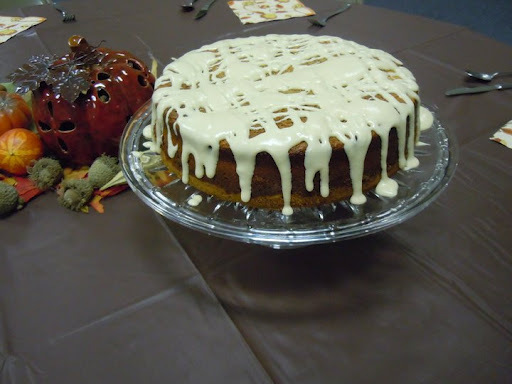 I still thought it was possible to use canned frosting (yuck!) to decorate. It really does not taste that great, and it doesn’t have the right consistency or body needed to decorate a cake, or cupcake with! It does take color fairly nice, but that’s about it! 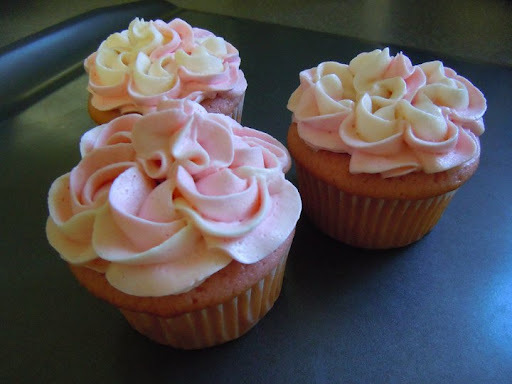 If you need to use a canned frosting, make sure it is a decorators frosting like Wilton or a brand like that. I recommend making your own. It tastes better, and you can make it the consistency you need for your project. For a little while, I made a bunch of cupcakes. These are my favorite ones. They are strawberry with a 2-toned buttercream. I think they are some of the prettiest, and tastiest cupcakes I make! These would also be wonderful with a cream-cheese frosting. Naturally, the more cakes I made, the more I improved. 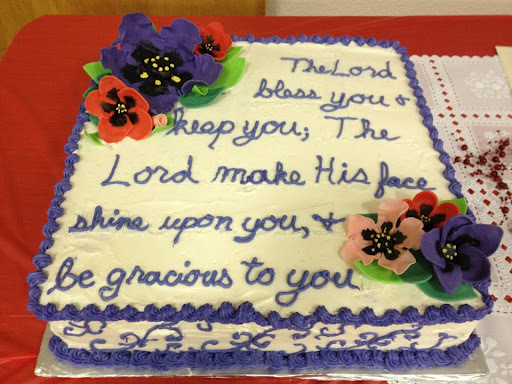 I started bringing a cake each month to our church potluck so I could get the practice. Originally, these were to celebrate the birthdays in the month, but I just decided to start bringing cakes. Here are some of my favorites. This cake was the first time I started using scrollwork and I realized how much I like to pipe. I think it’s pretty fun. 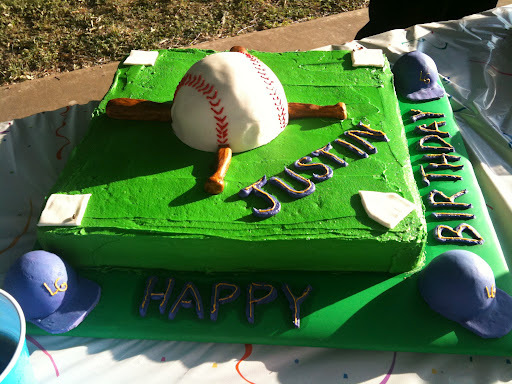 This is one of my favorite cakes because of its simplicity. Who doesn’t like cheesecake right? This is my favorite cheesecake to make. It is called Cinnabon Cheesecake. 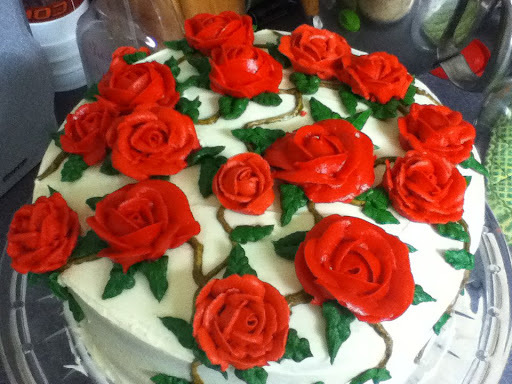 The rose cake was inspired by the hymn “Where the Roses Never Fade.” This was the first time for me to make buttercream roses. The first “big cake” I made was for my sons 2nd birthday. It was the first time I had ever worked with fondant. 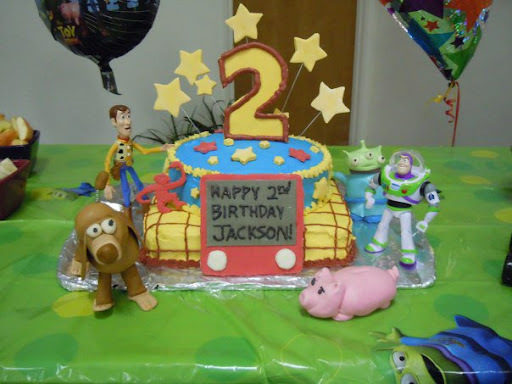 I had several ideas for his “Toy Story” party and went for it. It was definitely a learning experience, but I am still proud of this cake! I learned a lot about working with fondant and gum paste, and I learned a lot about stacking cakes! 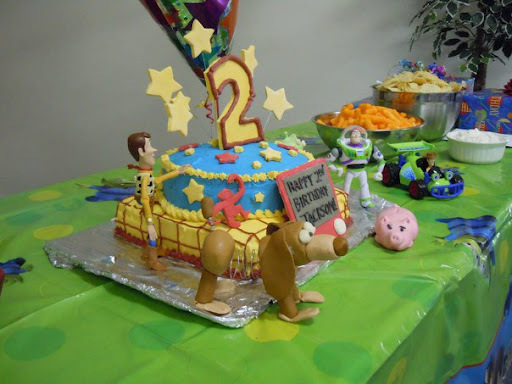 I made everything on this cake except for the Buzz and Woody figures. I thought they would be a little too ambitious for my first attempt with fondant. Plus, we already had those figures. I just washed them and added them to the cake with all of the other pieces. My favorite figure was Slinky Dog. He even “slinked.” I was also very proud of my “Barrel of Monkey’s” monkey. As I made more cakes for different occasions, friends started asking me to bake cakes for them! In one month, I made several graduation and birthday cakes. I finally began to feel like I was realizing my dream! This going away cake is one of my favorites. It was my first attempt at sugar flowers. I didn’t have any cutters at the time so I hand cut all of them. I like the way they turned out. The colors and scrolling also turned out nice. 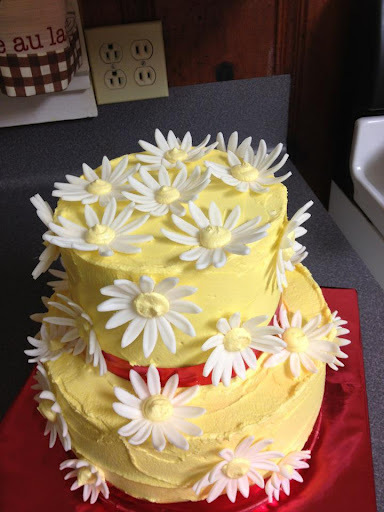 I made this daisy cake for a wedding shower. I used daisy cutters for it. I purchased them after I made the going away cake. Cutters make it a LOT easier to get nicer flowers with uniform petals. 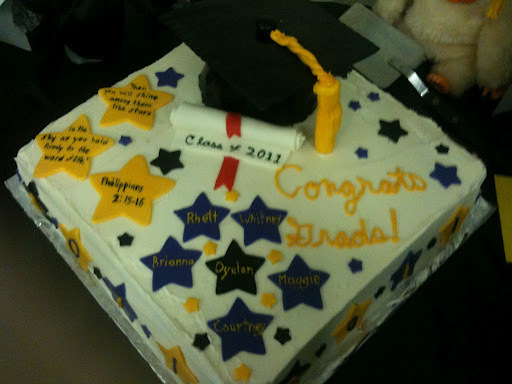 This graduation cake was fun! I used a paper template to cut the silhouettes. 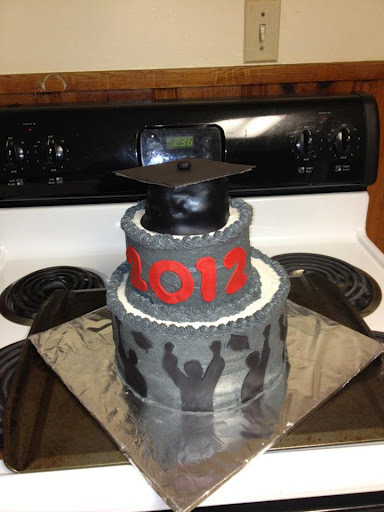 I did a lot of grey and black because the two graduates this cake was for are both boys and their school colors clashed. They both liked the cake, so I was pleased with it! 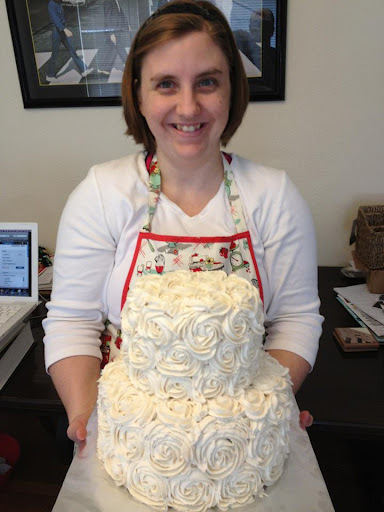 In the year and a half since I have been baking and decorating cakes “seriously,” I have always came back to my dream of having my own bakery. In the fall of 2011, Texas passed a cottage food law enabling me, and other home bakers, to have our own home bakeries, LEGALLY! That means I can bake and sell my goods from my home as long as I follow the specifications listed in the law! This wedding cake is very special to me. Not only is it my first wedding cake, it was also the first cake I made from someone I never knew before, and it was my first official cake to make from my at home bakery! While I still have a part-time job, I am realizing my dream. I may not have a store-front bakery, and I may never have one, but I finally feel like I am living my dream. My dream has finally evolved into a reality. And perhaps, one day, my dream will evolve a little more. If you have a dream or goal, and something is holding you back, don’t let it! Go for it! It may take awhile, but you will never achieve it if you don’t try. I’m not sure who originally said this because it has been attributed to so many different people, but I love this quote! If you are in the La Grange, TX area, and would like to talk to me about cake, feel free to leave me a comment or shoot me an email.